I often consult with clients who are in a health crisis. It's an incredibly difficult experience to navigate. It's such a hard thing when you are in one because you often don't have answers, you feel terrible, and it's easy to start feeling down and defeated. The first thing I can tell you about getting through a health crisis is that you will have a much better chance of healing if you view your health challenge as your body's way of communicating with you about what needs to change. 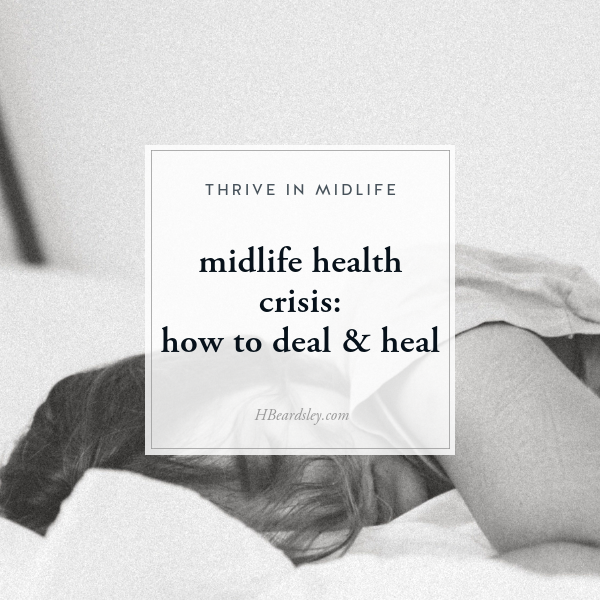 We know as midlifers that we can no longer take care of ourselves the way that we were able to get away with in our younger days. Midlife bodies, of course, need more—more nutrition, more sleep, and more attention. After years of taking care of us on auto-pilot, the body shifts in midlife and has to knock on the door of our consciousness in order to ask us to start participating as a benevolent steward. The body always communicates in whispers at first – an ache here, a migraine there. If we ignore or brush off those subtle signals, the body will eventually have to communicate with a health crisis to get our attention. You must be open to changing up your lifestyle, your nutrition, your beliefs, your relationships, your physical activity level, and most of all how you take care of yourself in order to be able to heal yourself from a health crisis. 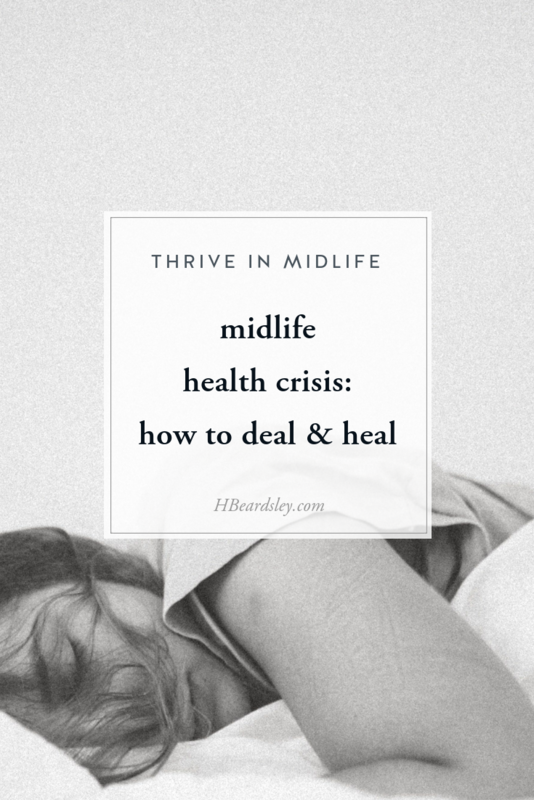 I often say that midlife requires us to learn to mother ourselves the way we always wanted to be mothered and taken care of. Midlife requires a turning inward. A health crisis is an insistent call to start listening to your body and its clues as to how to both heal and thrive. hormonal crash: The stresses of being a single parent (most of the year) and stay at home mom led to a decade of not sleeping enough & a lifestyle of chronic stress. This eventually led to a hormonal crash when I entered perimenopause at age 41. After I got bioidentical hormone therapy and made stress-reducing lifestyle changes, I not only healed but I felt better than I did in my 30's. adrenal fatigue: My body's increasing inability to handle excessive caffeine, too little sleep, and putting my needs behind those of my family members led to near-debilitating end-stage adrenal fatigue. After I cut down on caffeine and started taking better care of myself I felt better & got my energy back within 6 months. I also learned how to spot the subtle signs that my adrenals are becoming sluggish and I made adjustments upstream of a bigger problem. torn rotator cuff: working out too hard, pushing past pain, & not taking enough time to heal led to my injury. I had to learn to be kinder and gentler with my workouts and to stop pushing so much. For me, that means less CrossFit type workouts and more yoga and walking. unexplained weight gain: My body's increasing inability to properly metabolize carbohydrates was making me insulin resistant which caused unexplained weight gain despite eating fewer calories and working out constantly. As soon as I began eating a low carbohydrate keto diet, I was able to control and lose weight. plantar fasciitis: My body's increasing inability to properly metabolize carbohydrates was causing high blood sugar and increased inflammation in my body. As soon as I began eating keto it went away. At the time of each of those health crises, I had no idea why it had happened. I was stressed, anxious, and worried about myself. I even began to mistrust my body because it felt like it was continually letting me down. Not a fun place to be. When you find yourself dealing with a health crisis there are several strategies you can use to heal quicker and suffer less. We all go through it. You are not alone. Reach out and confide in someone which can help you get your worries and anxiety out of your head so that you can move on to from reaction to taking positive action. Secondly, there is research that suggests that the quality of how we think about our health serves as messages to our immune system. Positive thoughts and attitudes have been shown to strengthen the immune system, increase positive emotions, decrease pain and the severity of chronic disease, and provide stress relief. • I'm in pain and it's never going to get better. Try thinking instead: What does my body need in order to decrease the pain I feel? • I'm never going to figure out what's wrong with me. Try thinking instead: I'm going to figure this out eventually. I won't give up. • This is just old age; I'm falling apart. Try thinking instead: I won't always feel this way. Someday soon I will feel better. With time and attention on your thought process and practicing choosing more positive and uplifting thoughts about your health, you will signal your immune system and your body's own endocannabinoid system to heal and get back into balance. Thirdly, ask yourself what needs to change. Often we say we have no idea why our health takes a turn for the worse yet we aren't acknowledging the elephant in room. Maybe you've just come through a death in your family and you've been stressed and in grief. Are you ignoring the pains you get in your stomach after you eat certain foods? Have you been ignoring how your workouts always leave your lower back in pain? Does being around certain people stress you out? Have you been eating garbage and drinking too much? Take an honest look at your life and the obvious culprits and deal with them directly. Victim mentality and willful ignorance will never help you heal. Healing from a health crisis requires persistence–like continually trying different doctors until you finally find one who can help you. It requires patience because it just takes longer to heal in midlife. It requires approaching your health crisis like a detective because health crisis' can be the result of multiple lifestyle, nutritional, and personal factors. You need to reverse engineer the root problem back from the symptoms to how you live your life and determine the input(s) that need to change. It can feel exhausting and defeating, but you must never give up on yourself. Just tackle your challenges one at a time and resolve to never give up on yourself and believe in your ability to heal and regenerate. If you are in the middle of a health crisis remember to get help if you need it. It's what I do, so don't hesitate to reach out to me if you need me. Choose an option below to book a phone consultation with me.